William D.Drake proudly presents ‘Distant Buzzing’ – the official video, directed and produced by Ashley Jones of The Chaos Engineers. Released today. 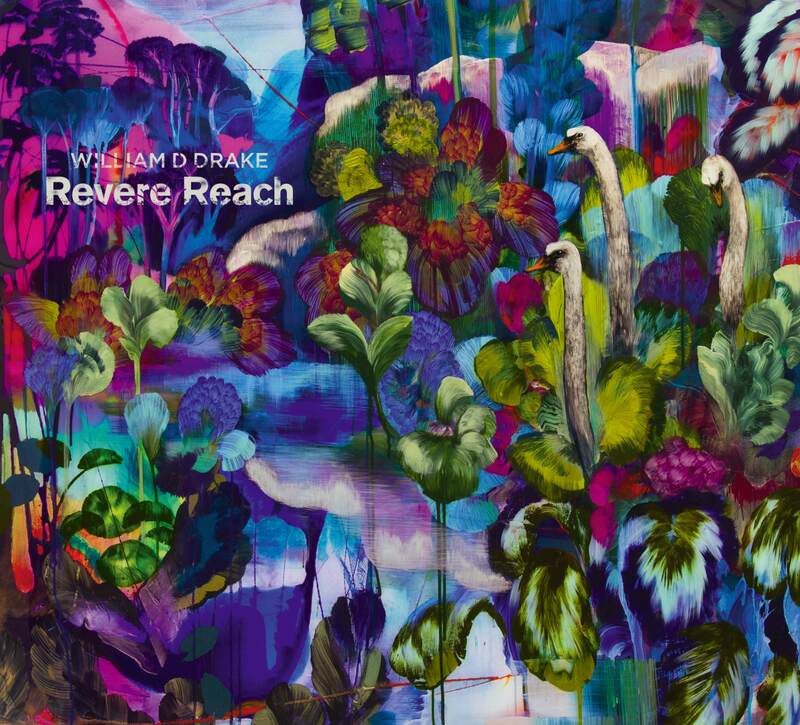 ‘Distant Buzzing’ is the opening track on ‘Revere Reach’, the new William D.Drake album, a hearty, joyous tune with lyrics penned by Mr Drake’s great friend Mr James Kelsey-Fry. The video is a merry romp with William D.Drake and his band of affectionate friends – fleeting moments invoke memories of Mr Drake’s days in Cardiacs long ago…..
Video by Ashley Jones of The Chaos Engineers, ably assisted by Jon Brain. Filmed at Brixton Hill Studios. LP including a promo CD while stocks last: £18.50 inc. postage & packaging in the UK. £19.50 inc. p & p in Europe. To keep things green we re-use LP packaging where possible. If you require brand new packaging please add £2 to the order. CD £12.00 including postage & packaging in the UK. £14.50 inc. p & p in Europe. Both LP and CD £28.50 including postage & packaging in the UK. £31.00 inc. p & p in Europe. For other international shipping, and multiple orders, please reply to this email and we will get a quote for you. Note that the paypal address for all orders is ONONIST@ONOPHONIC.COM. Previous William D. Drake releases Yew’s Paw, Earthy Shrine and The Rising Of The Lights remain available direct from us and can be added to your order. A full discography is here. Barringtone are playing a London show this Friday with Knifeworld and Cesarians at Boston Music Room, N19 5QQ. It’s an early start with Barringtone onstage at 7:30 and Knifeworld headlining at 21:30 so arrive early to avoid disappointment. We hope to see many of you for what promises to be a spectacular night. Revere Reach, the magnificent new album from William D. Drake and his band, will officially be released on the 15th of June. It is available on LP (HUM13), CD (HUM14) and download via iTunes. It is distributed by Cargo. It will be streaming shortly for your pleasure. For his fifth solo excursion, former Cardiacs keysmith William D Drake takes us on a serpentine path through the inner regions of Revere Reach, a part-imagined landscape composed of memory and fantasy. At once heart-felt, hearty and absurd, its heady reveries blend ancient-seeming modal folk melody with an obliquely slanted Rock thrust. Anchored around the gutsy centrepiece of ‘Heart Of Oak’, a maritime mover with sinuous hurdy-gurdies snapping at its stern, the surreal rubs tooth-by-jowl with the unabashedly romantic. Andrea Parker and Drake’s twining vocals clear a perfect moment of stillness within ‘In Converse’, re-imagining J M Synge’s sublime Irish odyssey. The dulcitone and choral chant of ‘Be Here Steryear’ recalls the unfathomable circling thoughts of a moment of waking or falling asleep. Drake’s dark-hued vocals and insistent harmonium propel ‘The Blind Boy’, driving a defiant splendour into eighteenth-century poet-laureate Colley Cibber’s words. With its caressing push and pull tempo, husky sax and lacrimose musical saw, ‘Castaway’ has the sultry lilt of a long-lost recording committed to wax on some dizzyingly hot evening in the 1930s. From the opening stomp of ‘Distant Buzzing’ to the ‘genie back in the bottle’ parting squeal of ‘Orlando’, Revere Reach is Drake’s richest and most captivating set to date. With the addition of Rhodri Marsden (musical saw) and Mario Castronari (double bass) on Castaway, and Chris Powell (percussion) on Distant Buzzing. For more information see the release page. Released 2nd March 2015 on limited edition of 250 7” vinyl & download. You can pre-order now direct from us for £4.50 inc. postage in the UK. Paypal to ononist@onophonic.com or email onoman@onophonic.com for international shipping or any questions. Free promo CD with all orders while stocks last. There is a launch gig at The Shacklewell Arms, London on 4th March – free entry to all. HUM12 is a double A-side from Barringtone available on 7” vinyl (250 only) or download. Barringtone are: Barry Dobbin, formerly of Clor, (Guitar and Vox), Connan Cooledge (Bass) and Boomer Opperman (Drums) – they create an avant-pop/rock deconstructionist sound that weaves along an intrepid path. A heady mix of power pop, anthemic rock riffs, guitar/synth wig-outs and off-kilter vox are enthusiastically pulled apart and reformed with unapologetic vigour. 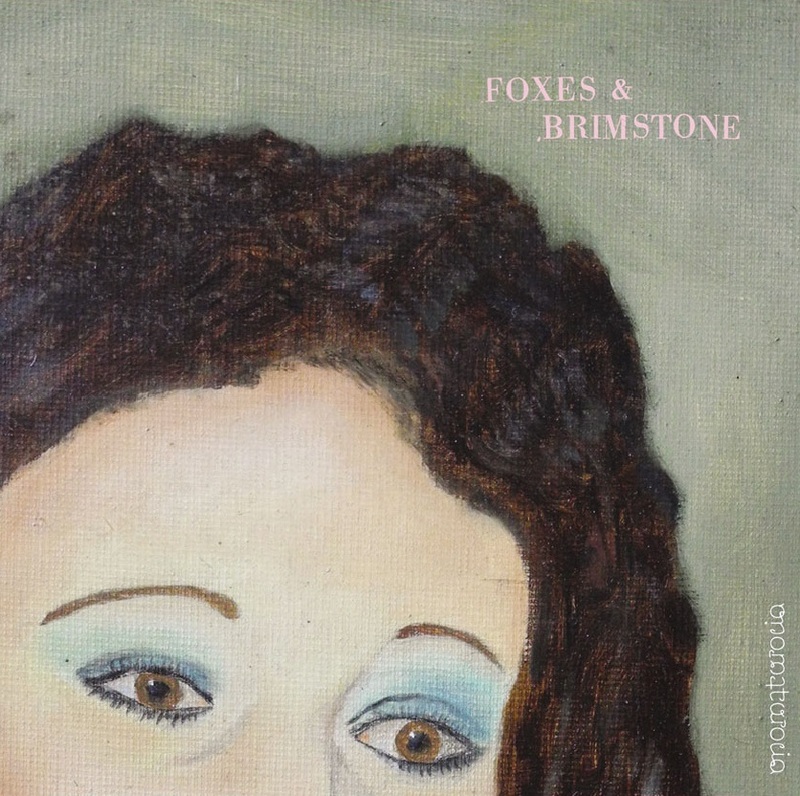 “Feverhead/Foxes & Brimstone” showcases the benefits of their eclectic approach, balancing the complexities of out-there prog with the direct motorik drive and brevity of pure melodic pop. HUM11 is ready for launch and will be with you this autumn on 10″ vinyl and download. 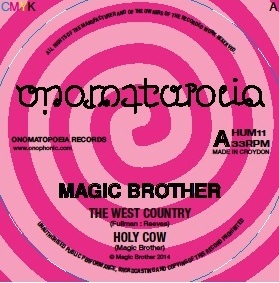 One way up is cassettes – The West Country, the other way up is Magic Brother – West Country. Either way up this is the cover of the next Onomatopoeia Records release which is catalogue number HUM11. It’s a split 10″ with two front covers (as seen here) AND two back covers AND 2 versions of West Country (one by each band) AND 2 other tracks (one by each band) AND a special unlisted demo AND the test pressings have been approved AND AND AND the release date is 26th Sept. The best, and fullest, audio experience will be heard on the 10″ record (including free download code). Downloads will also be available from iTunes etc. This is how the delightfully psychedelic labels look. Barringtone play their only gig of the year this weekend. Details here. They are ultra-close to finishing work on an EP for Onomatopeia which will be out in 2014. More info to follow. Magic Brother, who have just finished recording for their side of the West Country 10″ which will be next Onomatopoeia Records release (HUM11), play at the Dogstar on Saturday. It’s FREE. You can also get a free download of the studio version of “Lawrence” as a teaser for the next album from http://williamddrake.bandcamp.com/track/lawrence. All you’ll need to do is deposit your email address to receive the tippity toppity track. Henceforth you will be on the Drakey mailing list with all the duties and responsibilities that entails. Please feel free to share this far and wide. First up due to it’s imminent state…Mr Drake and his full band will be performing on noted fan Marc Riley’s show on BBC6. At 7pm on the 29th October Mr Drake and the band will perform some songs live to air, sparkle with effervescent wit during some chit-chat and deliver a tip- top time via the airwaves. Overseas fans will be able to listen on-line with information here. And to see if you are r.e.a.l.l.y. paying attention a sneaky snippet for you…early stage recording has begun on what will become the fifth Drake album. Factoid: one of the Riley shows’ jingles “Wooly Mammoth” is a William D Drake recording. what began as a drunken chat in a pub garden in croydon last winter (it probably would have been the dog & bull – or, as it is affectionally known, the bog & dull. ), cassettes, and indeed our aural cousins, magic brother, (being good drinking and bad smoking types) and onomatopoeia top buzzer, nick bourne, huddled around the broken heater in the snow and cooked up the idea of recording and releasing a split single. through a twist of taste and fate both bands have found themselves playing a song written by both magic sam and myself at the tail-end of the last century when we were rehearsing under the name of ‘the crown electrics’. the ‘lectrics were a short-lived outfit lasting, i think, one weekend! the song in question being a ditty entitled ‘west country’. over the years both cassettes and magic brother have rendered this song with their own special qualities. well the idea would have stayed as just another drunken winter dream had it not been for the cut & thrust of mr. bourne. and now, almost a year later we find that we have recorded ‘west country’ and the split-single inches closer to a reality. Both bands are playing as part of this weekend’s Croydon Oxjam thing so why not come along and see if you can get an inkling of why we love these bands so dearly. Thirdly for purely chronological reasons – yet more BIG news. BARRINGTONE are Barry Dobbin, Connan Cooledge and Boomer Opperman and their collective exploratory sonic creations exclusively earmarked for an Onomatopoeia release in the New Year! We were utterly blown away at their shows (with The Chap and Knifeworld) by the power, control, complexity, and melodiousness that they magic up. Sometimes channelling the wilder excesses of Dobbin’s previous incarnation Clor, othertimes putting us in mind of the kind of the telepathic force of Starless King Crimson. We anticipate they will emerge from their underground facility laden with new musical goodies in the not too distant future and of course we’ll keep you posted. Stars In Battledress – James Larcombe’s main band and one of the best ever – truly – are playing at the Buffalo Bar, London on 24th October. Knifeworld are touring with Fierce And The Dead and Trojan Horse from 27th Oct – 2nd Nov where they finish up at The Lexington in London and will take the roof off the place. Horton Jupiter, formerly of They Came From The Stars I Saw Them hosts and DJs at pagan discotheque The Thing on the 26th Oct with special guest Cottam. They deliver cosmic/eclectic/adelic: 100% party kicks from another dimension. Drums, Drums, Drums, Drums, Drums. And some drums. So there you go. That was fun. We should do this more often. Any vinyl purchased from the label will come with a promo CD while stocks last. Contact onoman@onophonic.com for prices inc shipping, demoes, or anything else. If you want to be taken off this mailing list then just say so – no hard feelings will be felt. 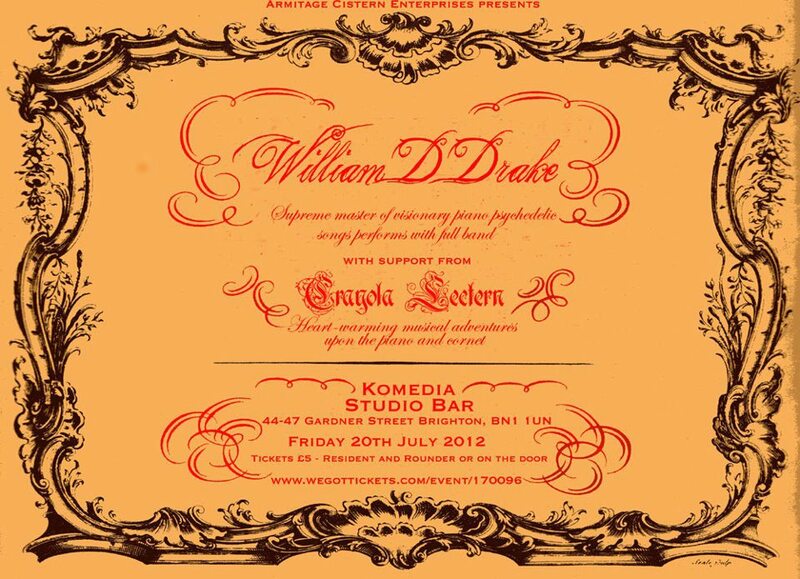 William D Drake – Komedia, Brighton, 20th July 2012 – Seaside treat ahoy! Bill and the band will be playing with Crayola Lectern. So far in 2012 we have released Luck Had Nothing To Do With It by Pinhead Nation – see their own page for info, reviews and samples. 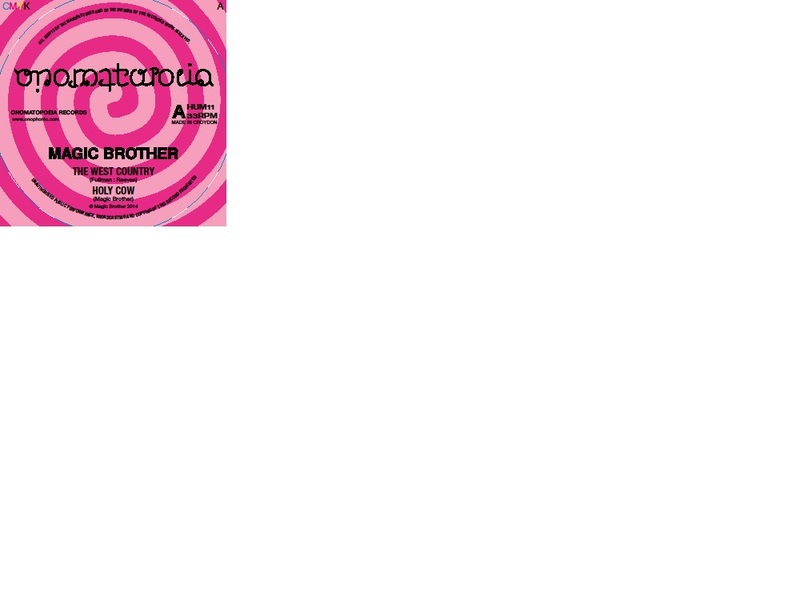 Forthcoming in autumn 2012 will be a split single by Cassettes and Magic Brother. 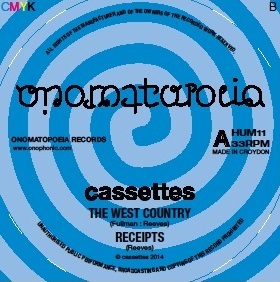 The single will feature 2 versions of the tune West Country which was co-written by Nick Reeves (the main cog of the Cassettes) and Sam Fullman (who put the Magic in the Brother). Both bands will also contribute another song making this a 4 track, 10″ vinyl release, in the grand old indie style.